Have you planted your winter veggies yet? Good news is that it's not too late. Now is the perfect time to put in some winter veggies. If you've already planted some put in some more so you get an extended harvest. Some of our favourites and a must in our garden every year are broad beans, broccoli, broccolini, cabbages, cauliflower, swedes, turnips and peas. Also get your garlic in if you haven't already - ours has started shooting and is about 5cm high, we planted about 120 this year. Try growing potatoes, they are easy to grow and fresh straight from the ground taste so much better. Just remember to ensure you purchase good quality organic seed potatoes. Potatoes are one of those things that once planted are hard to ever get rid of so you need to take that into consideration as to where you plant them. We don't mind that they keep popping up in our raised veggie beds. Just plant what you like to eat and enjoy. 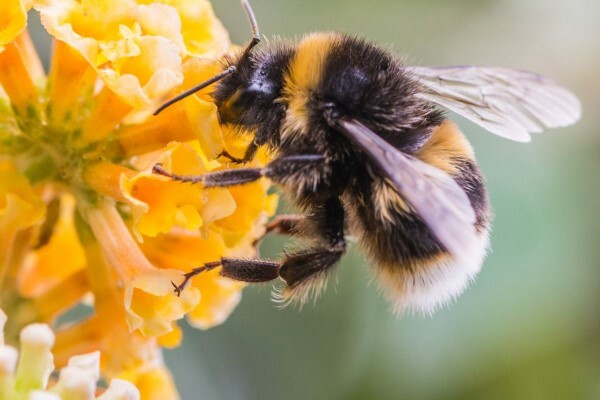 Today is World Bee Day. These amazing creatures are so hardworking and do an incredible amount for us and our planet. Bees are very susceptible to the sprays etc that people use in their gardens. Another good reason to think about what chemicals we use and to choose better (and healthier) alternatives. We all need to look after our bees. 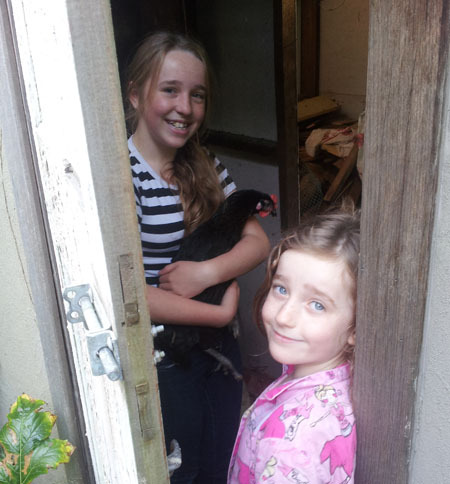 We breed and sell beautiful healthy chooks at various times throughout the year. We specialise in 4 lovely pure breeds which are particular favourites of ours - Australorps, Cochins, Silkies & Wheaten French Marans. We are currently breeding up another 2 pure breeds which we are really excited about and hope to be selling later this year so watch this space. At the moment we have gorgeous cross breeds available for sale in 3 colours which are ready to start laying their delicious eggs in the next few weeks. These girls are all vaccinated against Mareks disease and are very healthy & friendly. This is a picture of them that we took this morning. We are open Saturday 18th May 2018 any time after 9.30am. Call Greg on 0431 382 230. As is our tradition, Melbourne Cup weekend we spent a day in the veggie garden preparing beds and planting summer veggies. Our first job was to pull out the remainders of crops that we no longer required and I took them down to the cows and sheep. They love it when we clean up the veggie garden and happily munch on all the left over plants. They feasted on Brussels Sprouts, Cabbage, Kale, Cauliflower, Peas, Broccoli & some carrots that had gone woody. The chooks got a whole lot of Silverbeet & other leaves. We then moved aside the drip irrigation & barrowed a couple of loads of mushroom compost onto each bed and fork through. We add mushie compost a couple of times a year and the soil in our raised veggie beds is fantastic. Time to plant the seedlings grown in our hot house. 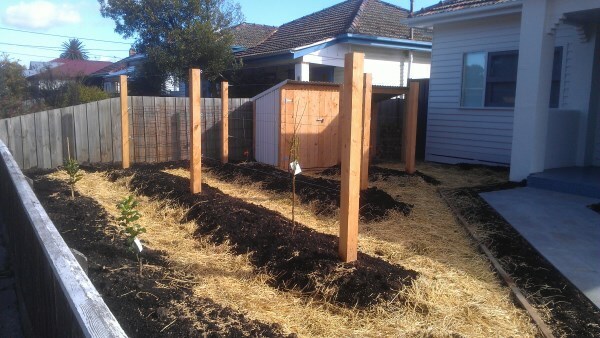 Greg put in stakes for all the tomatoes, capsicum & eggplants and trellis for the cucumbers and rockmelon. I mulched around the seedlings with sugar cane mulch and sprinkled around some coarsely broken egg shells I had been collecting over the previous few weeks. We planted tomatoes for eating & filled another bed with saucing tomatoes. We also planted capsicums, eggplant, chilli, lettuce, corn, carrots, cucumbers, zucchini, beans, beetroot, basil, pumpkin, rockmelon and watermelon. We gave the strawberries a good mulch, the mint a haircut, planted lots of bee attracting flowering plants and covered the almond tree (the Cockies were just starting to help themselves). Fast forward a week and a half and oh my. Half the capsicums were gone, the rockmelon had disappeared and nothing much had grown thanks to the weather. So disappointing! Snails & slugs even ate all the basil and flowering plants. I sprayed the remaining plants with garlic & chilli and sprinkled around some Diatomaceous Earth. You can imagine how annoyed I was when the rest of the capsicums disappeared a few days later. We have never lost a lot of seedlings in previous years. Yesterday I bought some more capsicums and a few other veggies & flowers and will replant this weekend. Our plan this time is beer traps. We will put some beer in saucers in the veggie beds every night. I will keep collecting egg shells and also coffee grounds (which the tomatoes love anyway). Fingers crossed these ones will survive and we will end up with loads of yummy veggies. This article is reproduced from Caterpillar News. It is fantastic to hear how their Community Garden which was designed and built by Yummy Gardens is being put to great use. 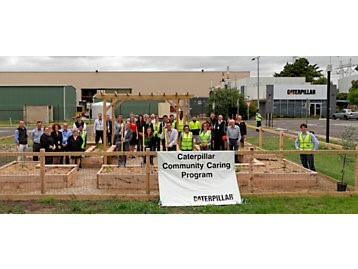 That’s the theme of the gardening activities undertaken by employees at the Parts Distribution facility in Tullamarine, Victoria, Australia. Since late November, more than 50 employees have participated in growing fresh vegetables in their facility garden, selling the fruits of their labor to their fellow employees and then donating that money to local charities. The teams, comprised of people from various divisions, will grow different crops depending on the season. This past summer (December-February), they grew tomatoes, lettuce, spinach, fennel, zucchini, peppers, herbs and much more. And to help shelter the garden from the wind, they’ve also planted a variety of fruit trees, including olive, peach, nectarine, plum and lemon. Participants spend about 30 minutes per week working in the garden, which is 10 meters by 8 meters (about 33 feet by 26 feet) and contains nine plots of varying sizes. The seeds and tools are provided by facility leadership, and the garden is watered in a sustainable fashion through an irrigation system fed by captured rainwater. Other employees echoed these sentiments and have found other reasons to get involved. “It’s a fun way to meet the people I work with,” said Melody Sorentino, a distribution research consultant in the Customer Services Support Division (CSS). “It feels great to come closer together as a team while also putting Caterpillar’s commitment to sustainability and the local community into action,” remarked Ivan Banadinovich, a business support consultant in CSS. “Australia CARE, the facility committee that coordinates our charitable efforts, leads this initiative,” said Paul Kouvelis, a sales manager in OEM Solutions (a business unit within the Diversified Products Division) and chairperson of the community garden. “This committee focuses on four core areas: health/well-being, local community engagement, volunteer efforts and social participation through sustainable initiatives. This garden program impacts all of these areas. 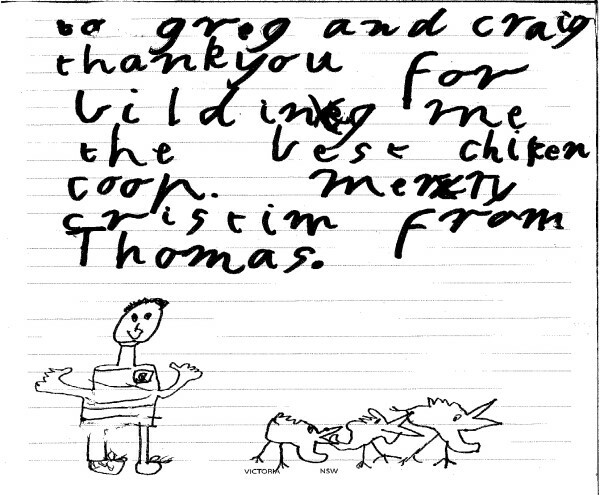 Greg was given this letter from Thomas after finishing a new chook house for his family just before Christmas. Thanks Thomas, we love it. It's a great picture of Greg & the chooks. We hope you are having loads of fun with your chickens and are getting lots of yummy eggs. 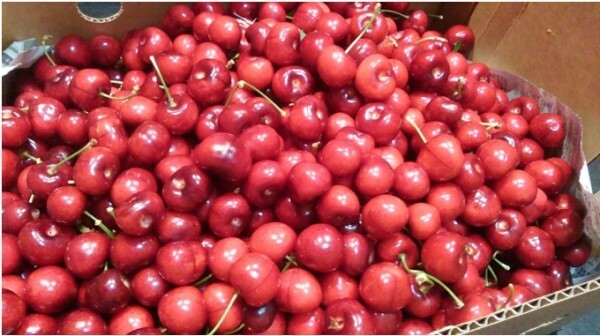 This is some of our yummy cherries we harvested in Dec 2015. Our cherry tree is not in a great position underneath a big old gum tree but despite that it still rewarded us this year with 6kgs of cherries. We plan to plant a 2nd tree this year. Now as lovely as cherries look I don't like them but Greg does. 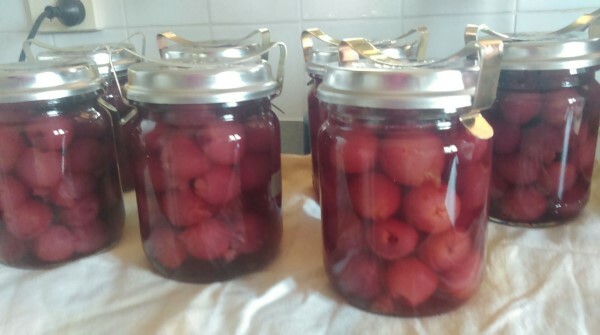 I felt it was a bit much for him to eat 6kgs of cherries (although I'm sure he'd have no problem with it) so I bottled 2kgs in an Amaretto syrup. These I will eat - they are delicious. We had some family over for diner the other night and I got out a jar of these with some ice cream for dessert and they were a hit. Easy, home grown and yummy. This year we harvested our organically grown garlic crop a little earlier than usual because we needed the space to plant out our summer veggie plants. 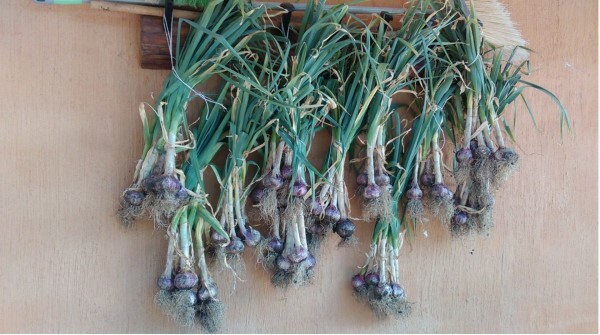 Here is our harvest hanging out under our verandah to cure before we store them in the pantry. Every year we save the biggest and plumpest cloves for replanting the following year so we know exactly what we will end up with and it also saves money. 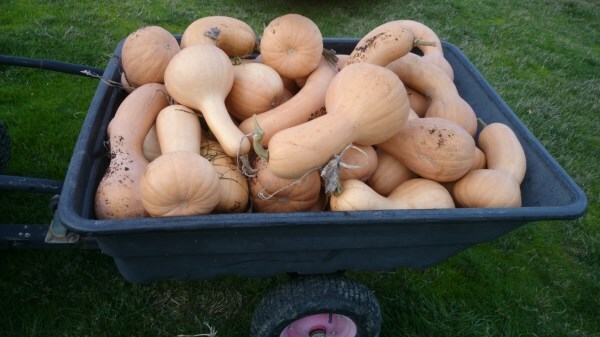 At Yummy Gardens we recently harvested our pumpkins. The variety we like to grow are Pennsylvania Dutch Crookneck which are the crazy curved ancestor of the Butternut. The barrow in the above picture is the trailer from our ride-on mower and it is full to the brim with yummy organic pumpkins. Greg counted that we have about 60 pumpkins this year, luckily they store well. The best thing about this variety is that the seed cavity is all contained down the bulb end and the long curved part is all flesh. These pumpkins are great for any use but our favourite is a Thai inspired pumpkin soup with some great crusty organic sourdough bread. Fantastic for a cold Saturday & Sunday lunch. Each year around Melbourne Cup Day we put our pumpkin seeds in. We mound up some of the beautiful organic veggie mix soil that we use in all our veggie beds and just pop the seeds in. We run a drip line out from our vegetable garden and spiral it around the mound so the pumpkins plants get the water they need over summer and then just leave them go until harvest time. Mmmmm - roast pumpkin, mashed pumpkin, pumpkin scones, pumpkin pie, pumpkin curry - I'm making myself hungry. A great way to irrigate your veggie patch is by installing wicking beds which keep your plants moist. 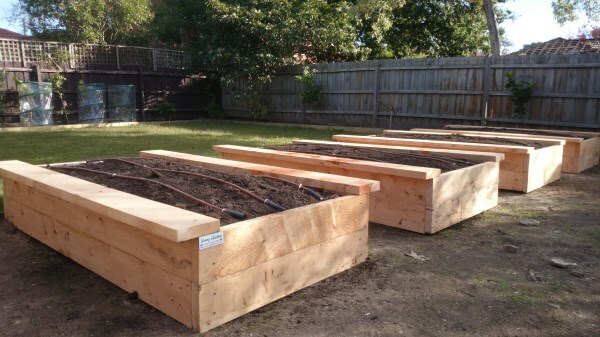 Continue reading "Why Install Wicking Beds?" Yummy Gardens breeds a variety of chicken breeeds and have chickens for sale. Contact us to see which chooks we have as chicks right now. 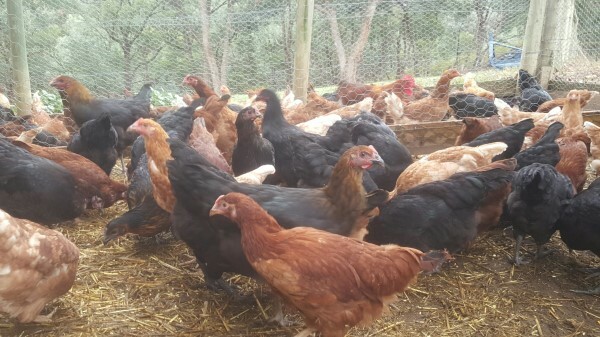 Continue reading "Chickens for Sale Melbourne"
Making weed tea is a great way of using the nutrients from plants that you either don't want in your garden or do not want to put in your compost. Weeds with deep roots such as comfrey, dandelion & nettle are great for weed tea as they leach minerals from the topsoil but you can use many others. To make weed tea place your weeds in a bucket & cover them with water (you may need to weigh the weeds down). If you can, use non chlorinated water as it makes it easier for the microorganisms to grow. If you only have access to mains water let it stand for 24 hours to allow the chlorine to off-gas before adding to the weeds. Add some brown sugar or molasses to the weeds & water to start the process off by providing the microbes easy access. Use a stick to stir the mixture several times a day for 10 days. In between stirring cover the bucket loosely so that air can enter. After the 10 days your tea should be used straight away otherwise it can become smelly & the microbes die. To use your tea strain it through some shade cloth or fine material (make sure you wear gloves). The solid material can be put in your compost where it will safely break down further. Apply to your garden either early morning or after dusk as the sun & heat can kill the living organisms. The best time to use teas is early spring through to the end of Autumn so the organisms can then work in the soil over winter. Make sure you don't apply the tea directly to vegetable leaves that will be eaten. Use the tea diluted 1 to 10 if using as a foliage spray or less diluted if applying to soil. Yummy Gardens can supply you with sustainable cypress sleepers for your raise garden beds. Continue reading "Sustainable Cypress Sleepers for Garden Beds"
Apples are the original superfood. They are extremely rich in antioxidants and contain essential nutrients such as Vitamin C & B-complex, dietary fibre, calcium and potassium. Remember the old proverb "An apple a day keeps the doctor away". Well according to many health experts the proverb is very true. This is some of the things that the humble apple does. 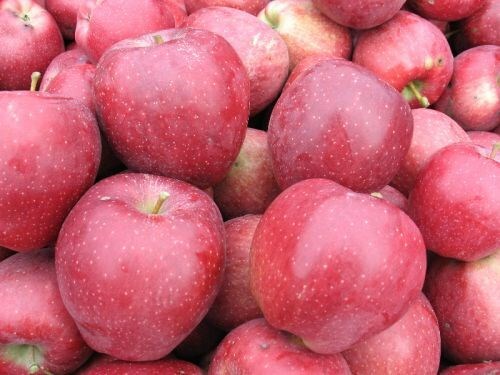 Most of the fibre & antioxidants are in the skin therefore you should eat organic apples which are wax free and have not been heavily sprayed with pesticides. 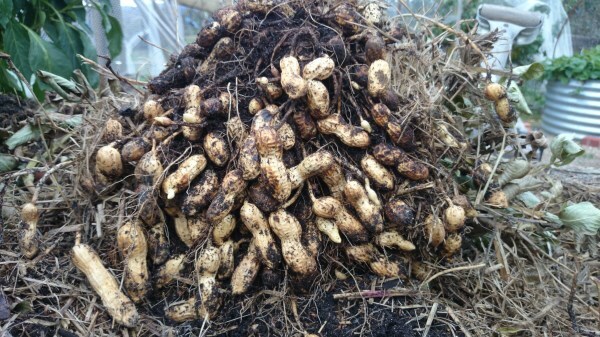 This weekend we harvested our peanuts. The plants had died off quite a bit so we dug around the edges with our hands to check some of the pods and decided that they were ready. We got a garden fork under the whole plant & carefully lifted it out with most of the peanuts still attached. If the ground is too wet you may lose some of the nuts. We have not had any rain during the week so it was a great time to harvest. As the plant itself was fairly dry we decided to pull the nuts off and spread them out on newspaper on the laundry bench to dry before storage. The great thing about peanuts is that unshelled they will keep for about 9 months in the fridge or indefinitely in airtight containers in the freezer. Consider planting some peanuts next Summer. We have just harvested some of our home grown olives. At the moment we have 4 olives trees which we planted along our drive as a beautiful(and tasty)screen. We decided this morning that we will plant another 2 to extend the screen. Our current 4 trees include 2 Kalamata, one of our favourite edible olives, a Correggiola which is an oil producing variety and a Manzanillo which is both an edible and oil producing variety. 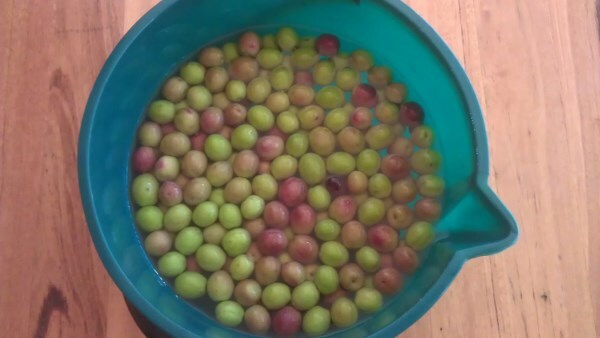 The Manzanillo are the olives pictured in the bucket. There are lots of different methods of home curing olives. We are starting by soaking them in water for 20 days, ensuring that we change the water every day. We will then soak them in vinegar for a couple of days and then spread them on trays and cover with salt for a couple of days before then brushing off the excess salt and preserving them in a brine. Yum! See pictures of just some of the chicken houses, pens and coops built by Yummy Gardens. Continue reading "Chicken Houses, Pens & Coops"
With summer approaching it's time to get those yummy summer veggies planted. Remove any old plants from your beds and move the drip irrigation to the side. We like to add mushroom compost to our beds and turn it in with a garden fork. Lay the drip irrigation lines back. Our favourites to plant in November are lettuce, capsicum, eggplant, chilli, silverbeet (remember to plant extra Silverbeet for your chooks), cucumber, beans, zucchini, pumpkin, squash, sweet corn, carrots, beetroot, watermelon, rockmelon and tomatoes. We also put in some sweet basil (yummy with tomatoes)and Marigolds to add colour and attract beneficial insects. Mulching your veggie patch helps keep the moisture in the soil. We like to use organic sugar cane mulch. Spending a bit of time in your patch in November means that you'll reap the benefits this summer with all your beautiful organic home grown produce. Nothing tastes better. Yummy Gardens keep several chicken breeds including Australorps and Silky Bantams. Continue reading "Chicken Breeds - Melbourne"
Not sure what to plant in Autumn in your Melbourne veggie garden? Check out the Yummy Gardens planting guide. Continue reading "Autumn Vegetable Garden"
Check out the Yummy Gardens Galleries to see pictures of garden makeovers, chook houses, raised vegetable garden beds and more..
Continue reading "Yummy Gardens Galleries"
Yummy Gardens specialise in raised vegetable gardens in a variety of materials, shapes and sizes. 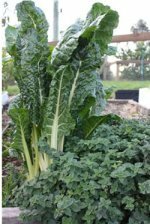 Continue reading "Raised Vegetable Gardens"
View some of the garden makeovers that Yummy Gardens has undertaken including native and drought tolerant gardens. See more pictures of the types of chickens bred by Yummy Gardens Melbourne. Continue reading "Types of Chickens"
Gallery of vegetable gardens designed and built by Yummy Gardens Melbourne. 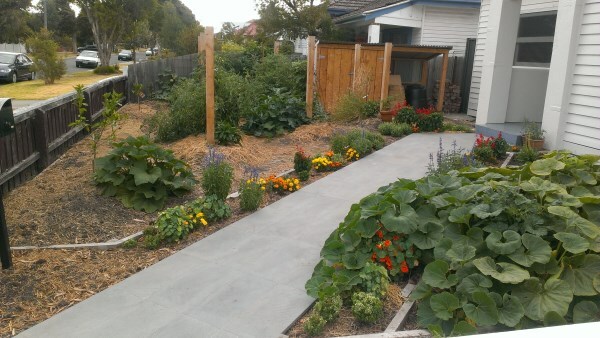 Continue reading "Vegetable Gardens by Yummy Gardens"
View just some of the backyard orchards that Yummy Gardens have helped to create in Melbourne. What and when to plant in your Winter vegetable garden in Melbourne. Continue reading "Winter Vegetable Garden"